Seagrasses in Shark Bay, Australia released massive amounts of carbon dioxide after a devastating heat wave killed them, according to a new study. More than 22 percent of Shark Bay’s seagrasses died when water temperatures warmed as much as 7 degrees Fahrenheit above normal for more than two months in 2011. Up to 9 million metric tons of carbon dioxide were released — the equivalent of what is released annually by 800,000 homes or 1.6 million cars. Healthy seagrass meadows act as giant reservoirs that store carbon in their soils, leaves and other organic matter. Although the devastating temperatures warmed Australia’s waters nearly seven years ago, its full effects have yet to be seen. The scientists estimate the dead seagrasses could release up to 21 million metric tons of carbon dioxide in the 40 years following the extreme weather event. If seagrass meadows stay intact, they can store carbon for thousands of years. Once killed, they release the stored carbon into the atmosphere as harmful carbon dioxide. A meadow’s ability to recover is limited and slow, often requiring the removal of dead seagrass and repopulation with the seeds of more resilient types of seagrass. 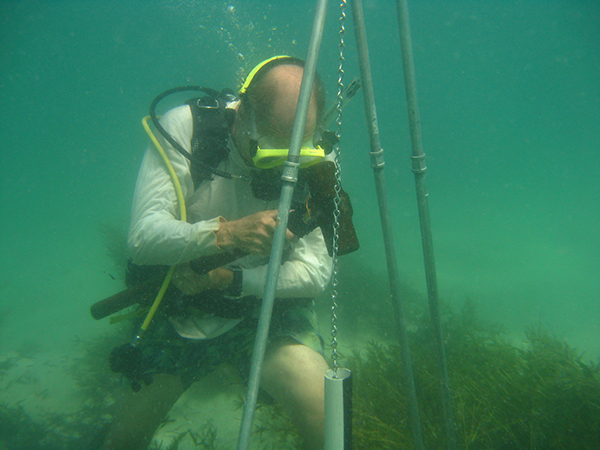 James Fourqurean collects soil samples from a seagrass bed in Shark Bay, Australia in 2011. Shark Bay has the largest carbon stores in the world with nearly 2,000 square miles of seagrass meadows. It was declared a World Heritage site by UNESCO in 1991. The Shark Bay Marine Reserves Management Plan protects the ecosystem against local threats, including agricultural and industrial pollution, overfishing and tourism. The plan, however, does not address global threats. Strategies are needed to address the impacts of heat waves, extreme weather events and climate change, which scientists said are difficult to plan for and manage. Fourqurean leads FIU’s Seagrass Ecosystems Research Lab which conducts research to inform scientists, decision-makers and the public about the important benefits seagrass ecosystems provide to people, animals and the environment. FIU has a long history of marine sciences research in Shark Bay, including estimating the amount of carbon stored in its seagrass ecosystems, the effects of the heatwave on endangered sea turtles, and seagrass recovery from the heatwave. Fourqurean has made presentations worldwide and testified before the European Union championing Blue Carbon, a global initiative that allows regulated sources to buy credits for greenhouse emissions, helping restore and preserve seagrasses for climate change mitigation. The research was a collaboration with universities in Australia, Malaysia, Saudi Arabia and Spain. It was led by Ariane Arias Ortiz from the Universitat Autonoma de Barcelona. Fourqurean contributed and analyzed data. He was supported by the Florida Coastal Everglades Long-Term Ecological Research (FCE-LTER) Program. Housed at FIU and funded by the National Science Foundation, the FCE-LTER Program studies how water, climate and people interact to impact the Everglades. The study was recently published in Nature Climate Change.